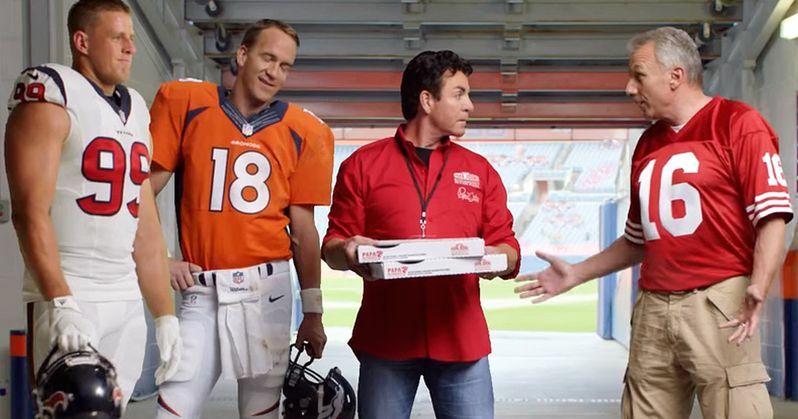 Pizza chain Papa John's says that the National Football League is to blame for their dwindling sales. Papa John's founder and CEO John Schnatter said Wednesday that the protests have had a negative effect on his pizza chain, which is an official NFL sponsor. Papa John's executives said that they have already pulled some NFL-associated advertising in response. Specifically, Papa John's is blaming the protests by NFL players who have chosen to take a knee during the National Anthem as a way to spread awareness of race equality. The controversy surrounding the protests reached fever pitch when the president decided to make it the focal point of his current administration. As a result, Papa John claims that the protests have hurt his pizza business and is going after NFL Commissioner Roger Goodell, saying "weak handling" of the league's National Anthem controversy has hammered sales of his pizza. Papa John himself had this to say. "The NFL has hurt us by not resolving the current debacle to the players' and owners' satisfaction. NFL leadership has hurt Papa John's shareholders." Papa John continued by saying that, "leadership starts from the top." Former San Francisco 49ers quarterback Colin Kaepernick was the first to protest racial inequality during the preseason in 2016, and many have since followed suit, including the Chiefs' Marcus Peters. Papa John's stock price has fallen 5% since August with reports suggesting that in-game pizza sales have dropped during the current NFL season, especially since the President tweeted out that Americans should boycott the NFL back in September. Papa John's pizza advertises heavily during the NFL games and offers specials during game days, but people aren't taking advantage of the cheap pizza deals during this season. Some have said that the decision to have former Denver Broncos quarterback Peyton Manning in some of the TV and print adds may have helped dwindling sales in certain markets. While the company's stock was hammered Wednesday, Papa John's third-quarter earnings of 60 cents per share were actually in line with the Wall Street analysts' expectations, and the company's $432 million dollars in revenue was actually higher than analysts initially projected. One thing that is for certain, Papa John's is probably going to see an even bigger profit loss for taking a stand in the National Anthem controversy. Many who would eat the pizza will more than likely lead a boycott of their own and head over to Little Caesars pizza instead. Regardless of how or why Papa John's pizza stock has taken a beating, they're still on top and doing better than they anticipated for the year. Another thing to take into account is the rise of services like Uber Eats and Postmates that have recently gained national attention. The services deliver food from any restaurant and even convenience stores, so there are more options for home delivery these days and maybe people want something better than Papa John's pizza or just want a change and have McDonald's delivered to the house while they continue to watch the NFL games. You can read more about Papa John's earnings via CNN.